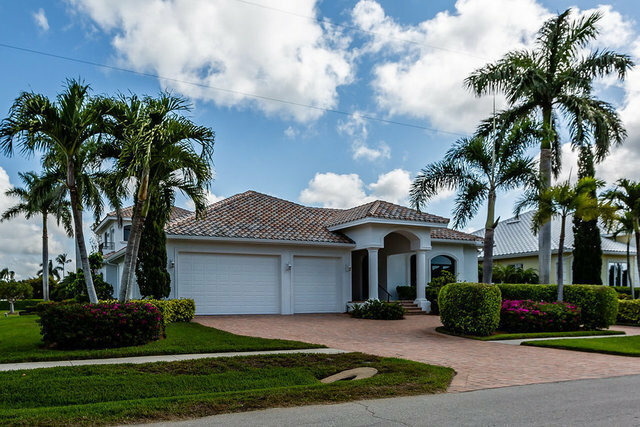 Stunning custom home with newly updated British West Indies designer look, featuring fresh bright white exterior paint, that complements and contrasts with the new tile roof. Exceptional larger canal home, with long water views, and 360-degree views from upper rooftop sun deck of the entire Island and surrounding Ten Thousand Islands. Only one canal off Marco River, desirable quick-out water direct location just minutes from Marco Pass. Priced to sell, an outstanding value for Marco Island, 4072 under air SF offered at $368 per foot. The beautiful, dramatic front arched double door entry leads to charming screened in courtyard with free form salt water pool and lanai, a perfect setting for entertaining. The separate, attached guest house is a great private space that can be used as a 4th bedroom suite or a spacious office, with its own front entry door and pool access. The Master Suite and an additional bedroom and bath are on the 1st floor of the main house, with a spacious full guest suite on the 2nd level, featuring service bar, sitting room and private balcony with long water views. Many new features and additions, including new tile roof, new paint, 4 new zoned HVAC systems.